Many of us perform the Ling test everyday but what do the results actually mean? We thought it might be helpful to provide some more detail to help you implement this listening check in your daily practice. Remember that this is just a listening check. The Ling test checks the hearing access of the person being tested throughout the full speech spectrum. We are looking for a clear detection response- a repeatable, consistent response to the sound. With little children it might be a nod, a smile or a change of breathing. With toddlers, we might ask them to put a ring on a stacking pole or put a marble in a jar because their physical development allows them to control this motion after that age of 18 months. Ideally, move to an identification response as quickly as possible- this is a repetition of the sound. This is where problems can occur. Not all the speech sounds are developed at the same time. Children take longer to produce /s/ and /sh/ accurately than they do with the other sounds. Don’t fall into the trap of trying to remediate the speech sounds. The Ling test is a listening check only! If the child cannot produce the sounds correctly, perhaps use the Ling cards or toys that match the objects and have the child point to them at the same time that they are saying the sounds so you can be sure they are identifying them correctly. If the child can indicate that they heard and identified the sound correctly then you know they have good auditory access. We are so lucky in Australia to have such great access to hearing devices for our families. The vast majority of our clients are fitted bilaterally with the best hearing technology in the world. This means we need to check that both the devices are working! Test each ear separately so that you can ensure that they are working correctly, and then test them together to see if there is an additional binaural hearing effect. If the child wears an FM, test with that. You don’t need to do all 4 tests every day but get into the habit of checking the individual devices whenever there is a concern about a child’s hearing. The sounds are recorded on this audiogram using the phonetic alphabet. You will note that the vowel sounds have 2 formants or vibrations recorded while the consonant sounds have just the first formant listed. This helps us to recognise where the problems are when a child makes an error. This is the lowest frequency check and measures responses at this low pitch. If a child confuses or doesn’t respond to /m/, then they may struggle to hear other sounds of low frequency. We use our low frequency access to develop speech with normal tune or prosody- the musical quality of our voices comes from our ability to hear these low frequency sounds. You will note on our audiogram that /u/ has each of its formants in the low frequency range. Sometimes children confuse /u/ and /m/ which may indicate problems with low frequency access. There are many vowels that sit in the low frequency range and a clear response to /u/ tells us the child will be able to access these as well. 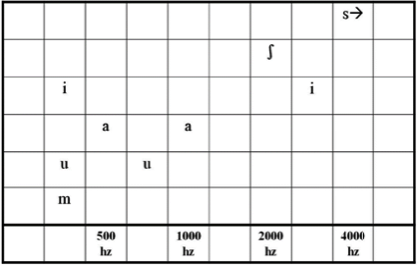 The formants, or vibrations for /ah/ occur in the centre of the vowel range. If children have poor access to /ah/, they may also have trouble hearing unstressed words like articles (a, the) and unstressed sounds (-ed, -es). This can lead to the child speaking and writing with grammatical errors. This is the most important sound of all! Take a look at the audiogram- one of the formants sits in the low frequency bands and the second sits in the high frequency bands. If the child doesn’t respond at all, there is a problem with their overall access! If they say /u/ when you ask for an /i/ repetition it indicates that they have problems with their high frequency access. If they say /s/ when you ask for /i/ repetition then there is a problem with their low frequency access. Children with conductive and mild to moderate high frequency losses often have less experience hearing the high frequency sounds like /sh/. It may take them longer to learn to attend to this sound if they are amplified later. As with /sh/, this sound may be unfamiliar to children with conductive and mild to moderate high frequency losses. It may take them longer to attend to this sound. Access to high frequency speech sounds allows us to discriminate, identify and comprehend running speech. It allows us to recognise sarcasm and irony. It helps us to hear plurals and possessives. It ensures that we can tell the difference between each word in a sentence, attend to each word and draw meaning from it. It is integral to good communication to be able to access this sound. Begin doing the test close to the child in a quiet environment- no further than 1 metre away. Take away all visual cues so the child is just listening and not lip reading. If you choose to cover your mouth, ensure it doesn’t interrupt the flow of air and muffle the sound. If the child can perform this successfully, first add distance- 2 meters and then all the way to 5 metres. This gives you a range of the child’s best listening in good environments- helpful to share with teachers. Once they are consistently responding at distance, add noise. Often that is already in place in noisy classrooms but if not, add sound from a radio or your phone. Classrooms are rarely quiet environments and its useful for the child to learn to discriminate speech sounds over the top of background noise. Hopefully this has been helpful! What strategies and activities do you use when you perform the Ling check? How do you manage this in a busy classroom? Do you coach your mainstream teaching colleagues about how to do this? We’d love to hear your thoughts!